Our tsunami warning system is faulty. Can these scientists fix it? Emerging technologies promise faster, more reliable life-saving alerts. Just after 12:30 a.m. on Jan. 23, a magnitude 7.9 earthquake hit the Gulf of Alaska about 350 miles southwest of Anchorage. Quakes of similar magnitude have triggered huge waves that killed thousands, and the National Tsunami Warning Center sent out an urgent alert; within minutes people along the coasts of Alaska and western Canada began heading for higher ground. But it was a false alarm. And while that was good news for people in the region, it points to a major weakness of existing tsunami warning systems, which base their predictions on seismic waves that pass through Earth’s crust after a quake as well as a global network of ocean buoys that monitor pressure on the ocean floor. All too often, the seismic data generate unreliable warnings — as happened after the Alaska quake — while the ocean buoy data deliver more accurate alarms but too late to save some lives. Emerging technologies are promising to do a better job. Several research groups have taken early steps toward the development of warning systems that would use alternatives to seismic waves to more quickly and more reliably predict when a tsunami is on the way — and how bad it’s likely to be. In the open ocean, tsunamis race along at speeds of up to 500 miles per hour. 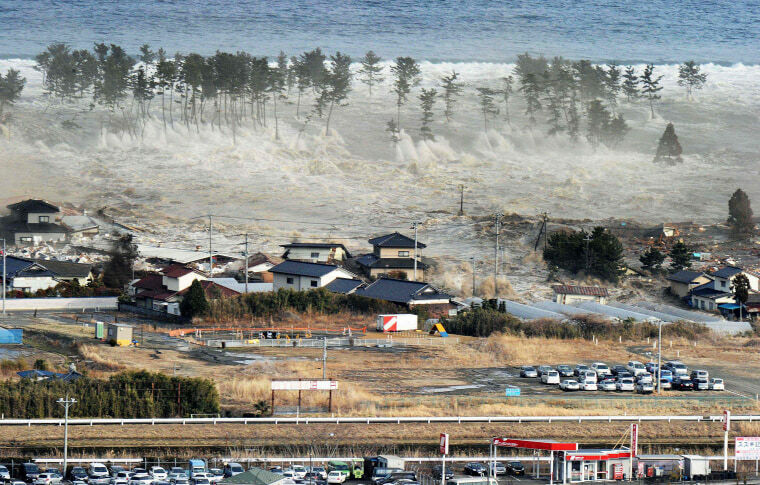 So while distant coasts might have hours of advance warning, coastal areas near the epicenter of a tsunami-triggering quake can be inundated within minutes. Kadri has done preliminary work on a system that predicts tsunamis on the basis of acoustic gravity waves — low-frequency pulses generated by the up-and-down movement of sea water in response to coastal landslides, underwater earthquakes and other events that displace large volumes of water. Though slower than seismic waves, acoustic gravity waves move through the water about 10 times faster than a tsunami, suggesting they have the potential to function as an early alarm. We can’t hear them, but acoustic gravity waves can be detected by sensitive underwater microphones known as hydrophones. Scores of these devices are already deployed around the world, and their surveillance capabilities could be expanded to listen for signs of tsunamis. The Preparatory Commission for the Comprehensive Nuclear-Test-Ban Treaty Organization, for example, maintains a global network of 11 stations that use hydrophones to listen for waves that might reveal an underground nuclear test. Hydrophones are also used by scientists to listen for whale calls, volcanic eruptions and other underwater phenomena. In a recent study in the Journal of Fluid Mechanics, Kadri and a fellow engineer showed that mathematical equations incorporating precise measurements of sound waves generated by an underwater earthquake and detected by a hydrophone can be used to calculate the key traits of the underwater quake that generated the waves. And Kadri says follow-up work suggests that the method can reveal — in less than a minute — the quake’s location, duration, magnitude and speed. From those rapid calculations, he says, a tsunami’s destructive potential would be easy to deduce and could help speed up urgent alerts while avoiding false alarms. Randall LeVeque, a tsunami modeling expert at the University of Washington in Seattle, and Diego Arcas, director of the NOAA Center for Tsunami Research in Seattle, agree that earthquake-generated sound waves can indeed be detected by distant hydrophones. But they say the model used in Kadri’s study, at least in its current form, may not reliably reflect tsunami-triggering events in the real world. Arcas says Kadri’s “rigorous and detailed” study could, however, lead to a new method that double-checks warnings based on seismic, buoy or other data, provided that its mathematical solution still works when tested on more realistic earthquake and ocean scenarios. Kadri acknowledges that his approach is based on certain assumptions that might not represent the real world with total accuracy. Even so, he says he’s pleased with how well the approach has performed in preliminary tests using real earthquake data and agrees that it could be combined with other methods to fine-tune future warnings. Arcas says other warning methods are showing early promise as well. Some research groups, for example, are using more sensitive versions of the same GPS systems that are ubiquitous in car navigation systems and smartphones to accurately measure real-time motion of the seafloor. The systems are so sensitive that they can measure the movement of entire continents drifting less than an inch per year. In the same way, GPS monitors used to record an earthquake “will tell you exactly how the ground is moving and deforming under these seismic waves,” Arcas says. Although GPS stations are limited by their availability in the world’s oceans (most, like those operated by the U.S. Geological Survey, are on land), several research groups believe that combining the existing GPS data with seismic signals could accurately and quickly pinpoint an offshore earthquake’s location and describe the shifting movements on the seafloor. Separate groups are building similar early warning systems based on ground motion data captured by satellites. Technology can only go so far, though, and despite a few false alarms, strong shaking in a coastal community may still be the most effective tsunami alert. “If you’re on the coast, of course, the best warning is the earthquake itself,” LeVeque says.